We were picked up at 9am by Apple, our teacher for the day. Then we went over to one of the hostels to get four other ladies who would be joining us for the class as well. They were a pleasure to spend the day with and we really enjoyed their company. A huge congrats to all of them for just graduating from medical school and we wish them good luck with their future endeavors. We then ventured to the market and had a little tour. Apple taught us about the different herbs and vegetables used to cook many of the dishes we would be making that day as well as what is used generally in traditional Thai cuisine. We looked at three different types of basil that are used in Thai cooking: sweet Thai basil, holy basil and lemon basil. We also saw the fresh vegetables in the market such as mini eggplant and crunchy eggplant. The mini eggplants are used in both raw salads and cooked curry and noodle dishes. The crunchy eggplant looks like a caper and is filled with many seeds, which makes it crunch. This is used in many of the curry dishes in Thailand. We also learned about the dried spice packages that are sold in the markets that are pre-made for an entire recipe. These are very useful and I really hope I’m able to find them back home. After exploring the market and learning about everything we will be cooking with, we went to the Basil Cookery Kitchen. The kitchen is in Apple’s home and has been transformed into a teaching kitchen with five two-burner stove tops. We began our morning making noodle dishes. I made pad see yew and Steven made drunken noodles. Everything we prepped for us and we just had to cut up some veggies and cook everything together in the wok with all of the spices. Next we made our soups and appetizers. Steven and I both chose to make the traditional tom yam soup. A creamy coconut soup with veggies and chicken. The girls made the sweey and sour soup. Both were amazing. We all shared and couldn’t believe how easy it was to make something so tasty. The tom yam soup could be spiced up to any heat level. The sweet and sour soup had a little kick, but nothing intolerable. For appetizers, I made fresh green papaya salad and Steven made fried spring rolls. We learned how to shred the green papaya two ways. Once was using a zig zagged peeler to creat even strips and the other was by hand. It was definitely very difficult by hand and we learned that you need a lot of practice to get it right. We made our dressing in the traditional wood bowls. I added a few too many hot peppers to mine and tried to balance with sugar, but it didn’t help enough. Next time, use less!! The dressing is made with all raw ingredients so everything is a lot stronger than when cooked. We mixed in the shredded papaya and other ingredients and it was ready to eat! 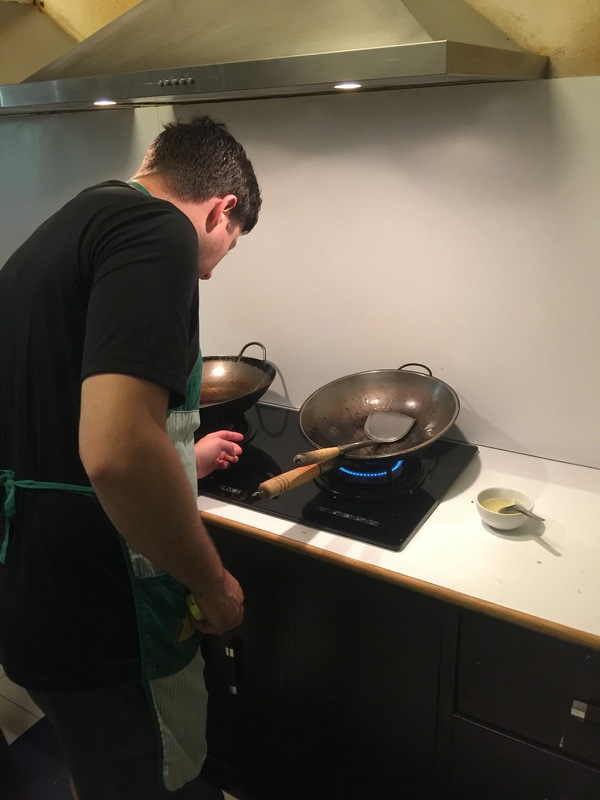 Steven prepped the filling of the spring rolls in the wok and learned how to make a perfect roll. He fried them in the wok and let them rest to drain the excess oil. All of the dishes were very good and we enjoyed another course before moving on to dessert and the last two dishes of the day. At this point we took a rest and Apple’s team had their lunch. We were very impressed with her entire team. Every time we finished prepping and went to start cooking our stations were cleared, cleaned, and replaced with fresh equipment for the next course. First, we made our desserts so that they could sit and cool during the time we made the curry and pan fried dishes. Steven made mango with sticky rice and I made rice pudding with crispy coconut. We let the dishes sit while we prepared our curry paste. I made green curry paste and Steven made pa nang curry paste. We put all of the raw ingredients into a motor and had to grind it by had until it was perfectly smooth. It took a lot of muscle and a bit of time. Once we made sure it was a nice smooth consistency, Apple told us we could just use a food processor at home. We all laughed…ahh the beauty of electronics!! We realized that the curry is cooked with coconut milk, in our case crash let made from shredded coconut! This means you can make the paste a bit spicier than you would want it to be after it is cooked. We then made our curry dishes, which turned out great. Finally, Steven made pan fried shrimp and I made chicken cashew nut. We sat down and enjoyed our curry and pan fried dishes. The curries were the perfect amount of spicey and the pan fried dishes came out so nice. Then we devoured our desserts. Everything we had made turned out amazingly. We definitely had plenty of leftovers, which we packed up to have for dinner during our night train back to Bangkok. Our experience was truly unforgettable at Basil Cookery. Thank you so much to Apple and her team for making sure we had a great time. Look out for the recipes to follow once we return to the states! We want to make sure we can get all of the ingredients and let you know where to get them as well. We can’t wait to cook for our friends and family when we return.